COMPLEX SAYS: Both clubs formed in 1945, with Partizan considered the team of the army and Red Star linked to the Ministry of Interior. 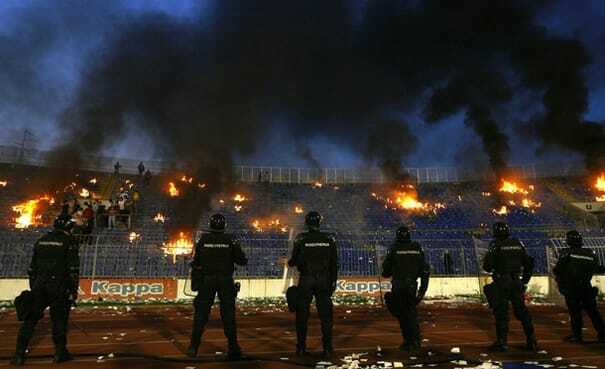 Since the breakup of Yugoslavia, violence has been a consistent theme, as Partizan fans (Grobari, meaning "Gravediggers") clash with their Red Star counterparts (Delije, which is more complicated to explain). The most notorious incident occurred in 1999, when a 17-year-old Red Star fan was killed by a flare fired from the Grobari area of the stand. Probably best to stay indoors. MEMORABLE MATCH: November 4, 1951, Red Star 2-0 Partizan. Although the derby intensified with Yugoslavian tension in the ’90s, this title-deciding tilt may have the rivalry's biggest match.